Welcome to the Death and Mr. 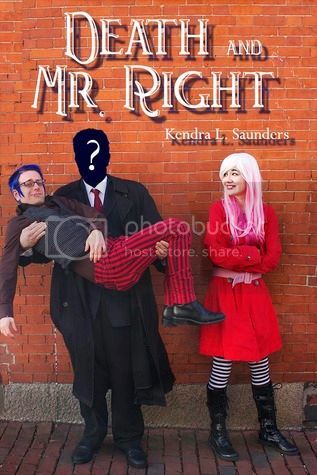 Right blog tour! Today, Kendra L. Saunders has stopped by to give us a little insight into nightmares! Have you seen her most awesome book? It is March 32nd, the day that doesn't exist, and Death, the agent of nightmares, has been demoted and exiled to live among mortals for the rest of his unnaturally long life. Everyone knows They don't look lightly on important items getting lost or an agent falling in love. Can the diva-like Death navigate the modern world, recover what was stolen from him (the names of the damned ooops!) and get his job back? Or will he fall in love with Lola, the pretty thief who got him into all this trouble in the first place? So, let's hear what Kendra has to say! I’m not a horror movie person. A good example of my relationships with horror movies is the time, several years ago, that I foolishly watched The Happening. Aside from the movie being a study in miserable acting, the careless suicide theme in the movie was so disturbing, so horrifying, so upsetting to me that not only did I have nightmares about it for nights after, but I felt as if the whole world around me had taken on a dark and suffocating depression. Even now, years later, images from the movie still leap back into my mind and leave me feeling uneasy. It might make sense that nightmares have been a recurring theme at times in my life, given this sensitivity to horror elements. A couple years ago I experienced sleep paralysis for the first time, in such an extreme case that I felt as if a small, heavy creature had climbed onto my chest and blown a lungful of cold air in my face. I freed myself from the dream and ran- LITERALLY RAN- down the hall to my parents’ room, scared to the point of crying and shaking all over. I did not go back to sleep that night. In the morning, a friend informed me that my experience was actually a universal one; something called ‘Riding the Witch’, or, in more scientific terms, sleep paralysis. A quick internet search revealed a painting from over a hundred years ago that featured a demonic little beast sitting on a sleeping woman’s chest. Eerily, the creature looked EXACTLY how I’d pictured my terrifying night visitor. A bit more research revealed that chances of sleep paralysis increase with stress and insomnia, along with sleeping on your back. Over the next couple years, I experienced sleep paralysis occasionally, though never quite to the same shocking extent as the first time. Death and Mr. Right is the story of a very diva-like blue haired agent of nightmares. This creature, Death (called “Kelly Gold” when he was but a mortal), concocts nightmares with a sort of childish glee… and he’s very good at his job! Death can scare anyone, anytime, and until he loses his job, he is destined to become one of the greatest nightmare agents of all time. Remember “Monsters, Inc”? Much how that adorable movie encouraged kids that maybe, just MAYBE, monsters were as afraid of children as children were of monsters, Death and Mr. Right provides a quirky explanation for those awful dreams we sometimes suffer from at night. Maybe the agent of nightmares needed to up his numbers this week. Maybe he needed to show off to his superiors with just how frightened he could make you. Maybe he (or she) wanted to test out a new nightmare method on you. Silly as it is, Death and Mr. Right was a way for me to face some of my own greatest fears. I wrote a handful of them into the book! Fears of your family looking like your family but actually being strangers, fears of amounting to nothing, fears of the sky turning red or some other odd color… Those and many others were woven into the story. The most frightening nightmare of all, though, came from a story my friend Kate told me. I had to borrow from it for the ultimate nightmare showdown battle at the end of the book. It’s the scariest nightmare I’ve ever heard of, and I’ll save it for you, when you read the book! So, what is your worst nightmare about? Kendra L. Saunders is the author of the magic realism novel Inanimate Objects and the dark comedy Death and Mr. Right. She has been published in Snakeskin Magazine, Premier Bride Magazine and has conducted interviews with NYT Bestselling author Jennifer L. Armentrout, goth rocker Aurelio Voltaire, fashion designers Fabio Costa, Melissa Fleis, Miranda Levy and Project Runway winners Dmitry Sholokhov and Michelle Lesniak Franklin for Ipmnation, Steampunk Magazine, The New England Horror Writers. She also has a lifelong passion for black and white photography and shares photographs from her travels and adventures through her website, facebook, tumblr and twitter.